We adopted LUCKY, a mixed-breed pup, from the animal shelter. His sweet little face had been more than I could resist! When we brought our dachshund (Mandy) home, they bonded right away and she taught him to play chase around the coffee table ~ their favorite game to play together. Lucky's smile was such that whenever we saw it (which was often! ), we couldn't help but smile, too. He brought so much happiness into our lives in the too-short 10 years that he was with us. He is buried in a shady corner of his adopted grandmother's flower garden. His passing left a huge void in our lives and a forever ache within our hearts. 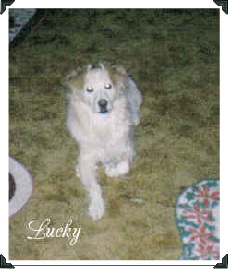 This picture of ^Lucky^ (above) was taken at Christmastime, 1999. It was to be ^Lucky's^ last Christmas with us. He went to the Rainbow Bridge just a little over three months later. "It is not that I am merely lonely for you, I am mutilated because you were a part of me."